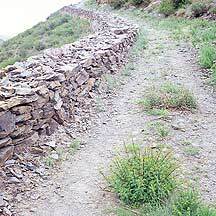 This part of the 秦朝Qin Dynasty (221BCE - 206BCE) Wall is located about 7 km. from 固阳县Guyang, a county 60km. 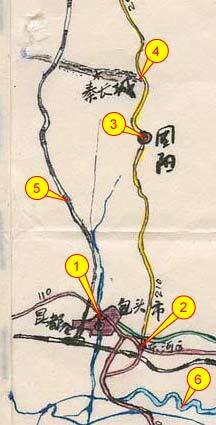 north of 包头市Baotou City in 内蒙古Neimenggu (Inner Mongolia) Province. The stone Wall snakes atop the 色尔腾山Seerteng Shan hills for 85km, passing three towns along the way. 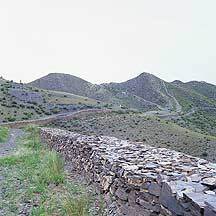 Unlike later Walls made of earth, gravels, and bricks, this Qin Great Wall is constructed of mostly heavy stone slates that were stacked up to form the barrier. 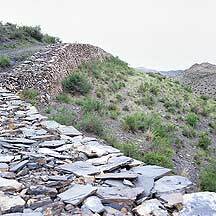 Its stones were locally quarried and carved into flat pieces; originally greenish and yellowish in color, but after more than 2000 years of embracing the elements, the slabs had turned black. 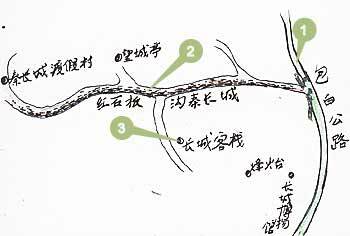 After two thousand years, much of the original Qin Wall now lay buried deep under the ground. But here you can see some of the original stacked stones exposed from a broken section. The beautifull rolling hills in the area. After a short ride from 固阳Guyang, I reached the Wall. I was here just after the entrance gate had closed, but there was a stone stairway on the side of the hill that goes up to the Wall. 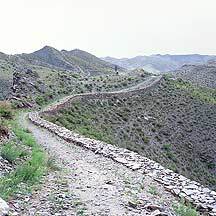 Once up, I saw the Wall lying quietly on the side of the smooth rolling hills. The part I saw had none of the scale and drama of other sections of the Great Wall, but on the colorful hills it had charms. So many years passed like falling leaves, much of the old Wall just got buried by the gifts of wind. And in its most active days, a hillful of sheeps may wander about its lost borders; so little was here to keep it amused that it got depressed like a forgotten hero. 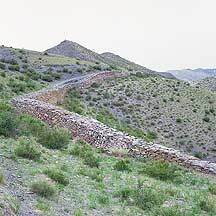 Much of the original Wall is now beneath the surface; on top are the new stones that followed the ancient buried Wall. In the two hours or so here, I met a group of Guyang natives touring the site. It was their first time here since the area was promoted as a tourist place recently. They were proud that the poor county now has a national treasure in their vicinity. Hopefully, it will help its economy. But it will take some time since it looked like we were the only tourists here. On leaving I walked toward the direction to Guyang, and waved at any vehicle along the way. No one stopped. Half an hour later I met a man sitting and smoking by the roadside. He is from 河南省Henan Province, and he worked in the nearby factory that makes firecrackers. 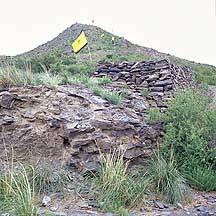 He pointed to the group of flat-roofed brick houses not far below the road. I squatted and spoke with him for a little more while I looked at the surrounding landscape. The crescent road is a cut from the slope of one hill after another. 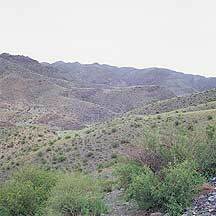 Off the hills is the vast earthy and reddish flat land — empty except for a short parallel line of trees. 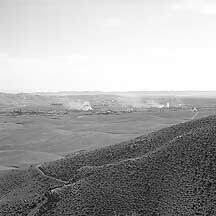 On this wide secluded land the firecracker factories were as quiet as a madman in crowded street. I left another half hour later with no luck getting a ride. So I continued my way toward the county. After another half hour of waving, a cargo truck finally stopped for me. Two locals were returning to Guyang. I climbed up the big truck and squeezed in. The men were in their late thirties, with the looks of those that build a country. They appeared to be tired, so the ride was quiet. At close to the town, I wanted to pay for the ride, but they refused. I had to insist several times til they finally accepted it. From the long-distance bus station in 包头市东河区Baotou's Donghe (2) district, take the bus (Y10) north to 固阳县Guyang County (3). The ride takes about an hour, but normally one waits another 40 minutes for it to start moving. From Guyang, take any bus (Y3.5) going north. The bus will pass the 秦长城Qin Wall(4), which is 7km. away beside the road. You will see flags and a large stone relief of the first emperor. Tell the driver to let you off here. The ticket booth is nearby. Alternatively, one can always hire a motuo motor bike (Y10-15) to get there. When you buy the ticket, you will also be given a tour map. On the map were indications of a large parking lot and lodgings (3). These lodgings are caves dug into the side of a hill. Restrooms and showers (if they exist) are probably communal. The area was some distance from the entrance, and since I did not venture that far I don't know anything about it. Wear thick-soled shoes as the ground has plenty of sharp stones to accompany you.